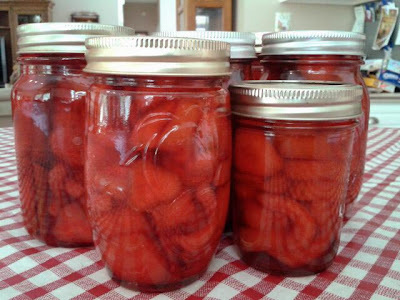 Paula's Red Hot Cinnamon Cucumber Pickles - Canning Homemade! I got an email a few days ago from one of my followers, Paula, about a jar that I had seen her post a while back. I had all but forgotten it and like magic there it was, not only the recipe but tips for the process since she had been making quite a few batches. This is a three day recipe before you can them so I just wanted to warn you in case you don't have the patience. "Hi, I think I owe you the recipe for these pickles and I have a few tips now that I have made several batches of these (21 pints in all). I took them to a party for my mother-in-law's birthday this weekend, and the entire jar was consumed, with people clamoring for more, so I think it's safe to say that this is a keeper recipe. This can be done over a 3 day period, which is great if you are pressed for time." 1. Day One: Peel and seed cucumbers if using overripe or large cukes. If using small pickling cucumbers, peel and cut into 1/4" slices. Mix the pickling lime with a 3 or 4 cups of water in a very large bowl and stir. Add the cucumbers and add more water to cover them. This should be done in a glass or ceramic bowl as the lime can pit or etch some surfaces. Let stand for 24 hours. It's not necessary to refrigerate or stir the cucumbers during this process, even though some of the lime will settle to the bottom of the pan. 2. Day Two: Drain the cucumbers and thoroughly rinse them to remove as much of the lime solution as possible. Cover the cucumbers again with cold water, adding some ice to it. Let stand for about 3 hours. Drain the cucumbers and rinse well again. All of the lime needs to be removed from the cucumbers. Alternatively, you can drain, rinse, and cover your cucumbers with fresh water every hour for a total of 3 hours of soaking time. OR, you can eliminate the ice and do this overnight in the refrigerator. 3. Day Two or Three: In a large pot, mix 1 tsp. red food coloring (optional, you will get a beautiful red color from the candies alone if you don't want to use food coloring), 1 cup white vinegar, and 3 or 4 cups of water and stir. Add the cucumbers and add more water to cover them. 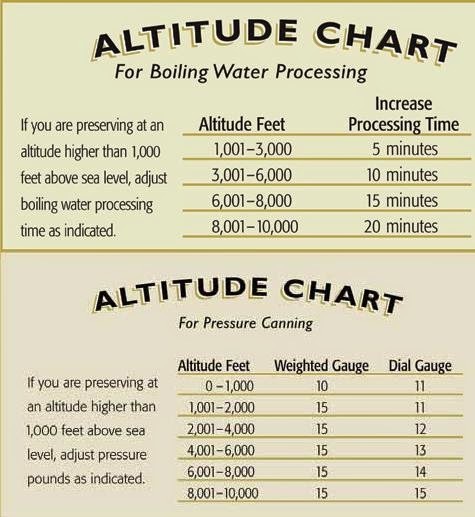 Bring the water to a simmer (not a boil) and simmer for 2 hours. Watch to make sure the water does not evaporate so much that you risk burning the cucumbers. 4. 1 hour before the end of the simmer time, make the Red Hot Cinnamon syrup by mixing 2 cups white vinegar, 2 cups water, 7 cups white sugar, 1 T salt and the 2 packages of Red Hot cinnamon candies. 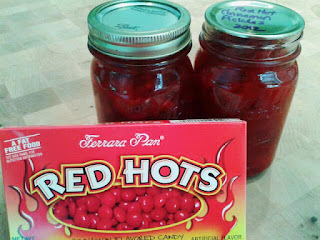 Heat to a simmer and stir occasionally until the candies are dissolved. 5. Drain the cucumbers, pour the Red Hot Cinnamon syrup over them, and let them stand overnight. 6. Day Three or Four: The following morning, heat the cucumbers and syrup to a simmer. The pickles will be a beautiful red color and will have a translucent quality to them, characteristic of pickles made with pickling lime. Pack them into hot pint size canning jars that have been sterilized leaving 1/4 inch of head space in each jar. Include a stick of whole cinnamon in each jar if desired. Cap with sterilized canning lids and rings. Process the jars of cucumber rings for 15 minutes in a boiling water bath. 1. 1 pound of cucumbers peeled and seeded will yield approximately 1 pint of pickles, so you can gauge the amount of pints you will get from based on the weight of the cukes that you use. This is a great recipe to use up overripe cucumbers, the ones that hid from you and got too big! 2. Unless you are using 4" or smaller pickling cucumbers which have very small seeds, be sure to peel and seed the cucumbers, then slice them into 1/4" slices. 3. It is not necessary to add the food coloring. In the photo that I provided with the Red Hot candy box, the jar on the left was done WITHOUT food coloring, the one on the right was done WITH food coloring. I can see no discernible difference in the two, so I don't think the addition of red food coloring is worth the expense. 4. The original recipe called for 1 cup of candies. The boxes are 6 ounces, so I added the contents of both boxes and am very satisfied with the results, plus this is another reason you don't need to add the food coloring. 5. The cinnamon sticks add some aesthetic appeal, but after tasting pickles with the cinnamon stick and some without, I don't detect a difference in the taste, so the use of them is optional. 6. Wide mouth jars are easier to pack with these pickles than small mouth. 7. Leftover cinnamon syrup can be canned and would make a great base for a wonderful vinaigrette dressing. Paula: "I hope you enjoy these, they are beautiful to look and and so crispy and yummy, not to mention a conversation piece at the table!"